Rachel Azaria second female candidate in Moshe Kahlon's party, brings focus on family to party platform. 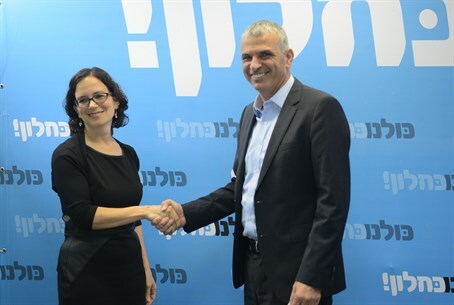 Deputy mayor of Jerusalem Rachel Azaria is the second woman to join Moshe Kahlon's Kulanu party, Kahlon announced during a press conference Tuesday. "I am pleased to carry over my work from Jerusalem to the national scale," Azaria said, adding, "I will continue to work for families in Israel. I want to ensure that each family can raise their children in dignity." Azaria, a social activist as well, then explained why she joined Kulanu. "Moshe [Kahlon] knows how to bring change, he did a lot for the benefit of Israel and he knows how to improve the daily lives of its citizens," she said. "I, too, have proved that I know how to act in favor of families and I want to continue and to work for them: to reduce the price of daycare for children ages 0-3, to bring down the price of after-school programs, to adjust the number of vacation days for parents and take care that each family can take care of their children and live with dignity." Kahlon said at the press conference that "Rachel is here for the same reason, we're all here for the same reason that this party was established." "The party has espoused a fight against monopolies, cartels and groups of power and our goal is to make life easier for citizens in economic and social areas," he said. "Rachel is with us here because she realized, as we all have, that monopolies and large corporations are not being dealt with. Sometimes struggle is private and sometimes it is public - and it starts with pacifier and baby formula and ends in a modest apartment. And so we need people like Rachel with a sense of mission, truth, strength and a desire to achieve the goal for the citizens of Israel." "The coming elections are not between right and left, but between people who make promises to other people," he said. "The coming elections are especially important for young couples who want to get their own apartment. The unbearable economic gaps endanger Israel." "A weak inside will bring a weak outside, so our job is to strengthen the State of Israel from the inside and that's what we'll do," Kahlon added. Kahlon is planning to present a total of eight women to his party list, according to Walla! News, reserving two spots on his 20-seat list from every five for female candidates. Kulanu thus far has focused heavily on economic issues - but unlike Labor or Yesh Atid, the former Likudnik has leaned toward capitalist, not socialist, solutions to Israel's cost of living and housing crises.